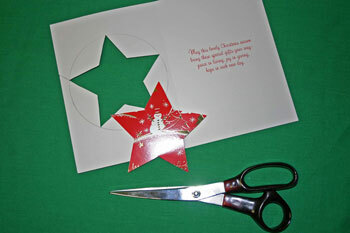 The Easy Christmas Crafts Five Point Star project uses those pretty Christmas cards that you don't want to throw away. 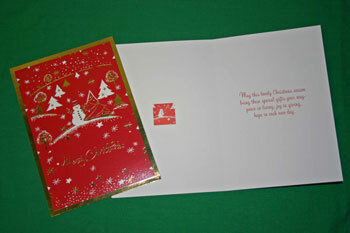 The instructions show you an easy way to reuse your cards as pretty decorations - both the cover and the message inside. Let's take a look at how to make an Easy Christmas Crafts Five Point Star. Select your card with an interesting picture or pattern that will tell its story in the cut-out star shape. The message inside should be small enough that the words - at least most of them - will be contained in the star. Draw the star on the back of the image. 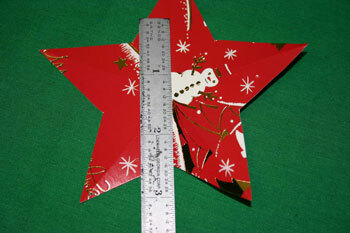 Size the Easy Christmas Crafts Five Point Star and center it to include as much of the image you want. Use the instructions or one of the patterns found on the Easy Paper Crafts - Five Point Star page. 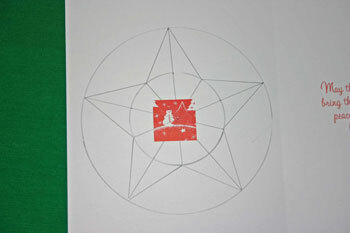 Cut out the star shape being careful at the outer and inner points. On the back, use a straight edge to help fold the points along the line. 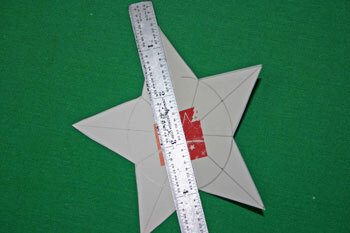 Press the fold only to the center of the Easy Christmas Crafts Five Point Star. From the front, fold on the line between the points. Again, fold only to the center point. 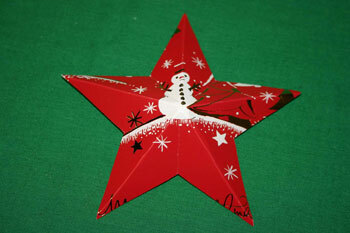 After completing all the folds, the Easy Christmas Crafts Five Point Star takes a three dimensional shape. 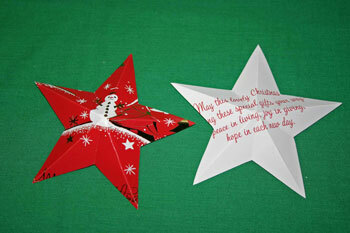 Follow the same instructions to cut out and fold the card's message into the star shape. Punch holes in the top point of both Easy Christmas Crafts Five Point Stars. Thread a piece of yarn through the holes and knot the ends to make a hanging loop. 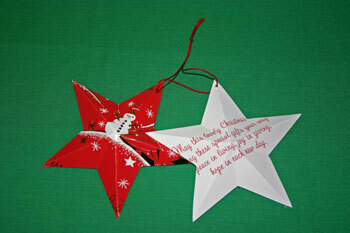 Hang the Easy Christmas Crafts Five Point Star on your Christmas tree such that both the front of the card and the message can be easily seen. 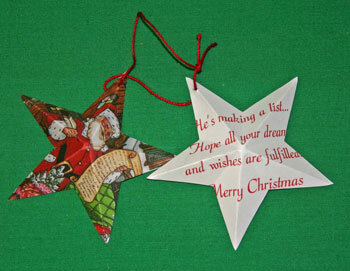 Here's the Santa card as an Easy Christmas Crafts Five Point Star hanging on the tree. 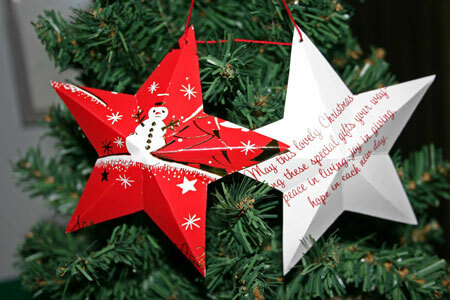 This Easy Christmas Crafts Five Point Star is an easy way to use those old Christmas cards. It's also an inexpensive way to add Christmas decorations to your tree. But, you don't have to use Christmas cards for the Easy Christmas Crafts Five Point Star. You can use construction paper, card stock, colored printer paper or gift wrapping paper. You can also use white printer paper and use crayons or markers to develop your own unique decorations. 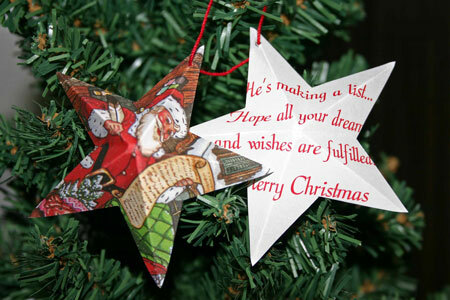 Children would enjoy coloring the Easy Christmas Crafts Five Point Star for decorating the Christmas tree. People of all ages can enjoy the fun and the decorations of the Easy Christmas Crafts Five Point Star crafts project.